My model’s clothing doesn’t work. How do I fix my broken model? How do I make my model’s clothes move with the model’s motions? Why do my model’s arms pass through the clothing as if there was nothing there? Hello everyone! Your favorite host, Hiiro-chan is here!! Because of what happened last time, our other OC staffs are currently hospitalized. Seems like they ingested some sort of mushroom that makes them…sing? Good thing I didn’t attend the banquet back then. Sometimes though, those questions will be passed to other authors as well, so we all can take our part in answering as well as communicating with you guys! Naturally since we (Silent Headset and co.) mostly cover PMDE/PMXE subjects, we got a fair share of PMDE-related subjects passed on to us. But since we have a “bad habit” of over-explaining stuff, we thought it might not be enough just to answer via an e-mail reply, especially if the subjects are something more complicated in nature. So an idea comes to mind. Write an article about them! Ahem, okay then, I think that’s enough for the opening statements. On to the main section! The clothes won’t follow the model as well! My model’s limbs repeatedly went through the skirts and dress as if there’s nothing! Okay, let’s see if we can answer them..
Q#1: Accessories don’t seem to attach properly. Well, this is most likely due to them not having been “weighted” properly yet. We do have an article explaining the weighting procedure, so you might want to check it out. 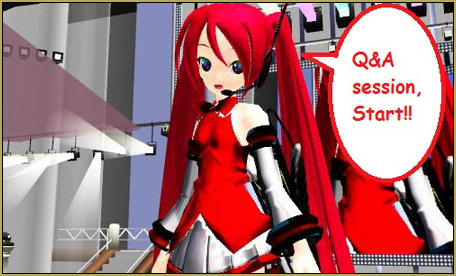 Q#2: Clothes aren’t working properly and won’t follow the main body. Well, now this one is pretty unique. I’ll assume that you’re trying to use clothes from other models (example: a skirt) and attach them to yours, right? The cause is probably that the bones on the clothes are not actually connected to where they’re supposed to. This is most likely caused when you’re deleting unnecessary bones from your clothes model. 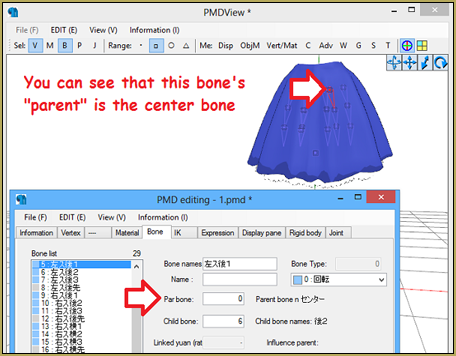 When you delete the “parent” bone, that slot will be reassigned with the center/motherbone. So when you import that piece into your model, they’ll still be assigned to the center bone. 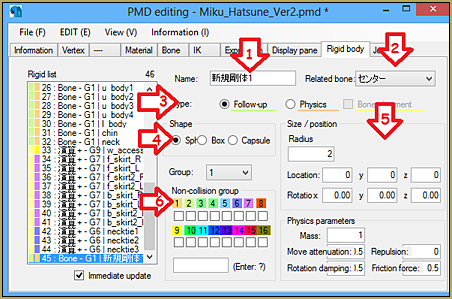 In other words, they’ll be following the center bone instead of your model’s actual movements. Now the skirt will be fully functional again. This is, without a doubt, a physics problem. Your model’s limbs can easily penetrate the clothes since there’s nothing there to stop them! 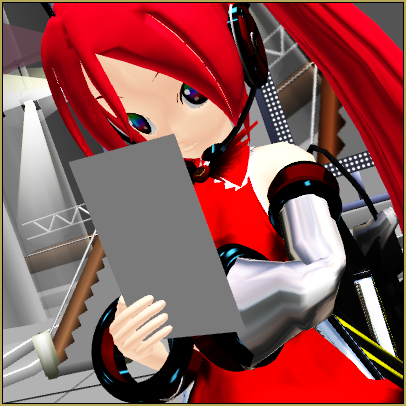 To put it simply, physics or “rigid body” on MMD models are some sort of “wall”. They prevent parts from overlapping and going through each other (or at least, they’ll put up a good fight before collapsing ^^). The catch to this system is, you need at least one wall on each side. 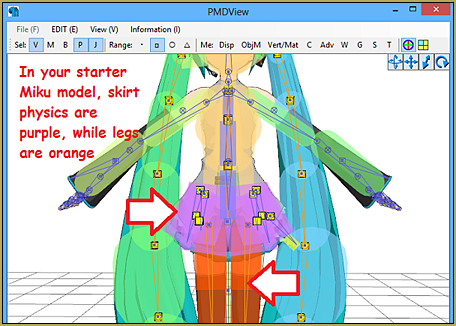 So if you have physics on your model’s skirt but none at the legs/ thighs, then it’ll still go through. 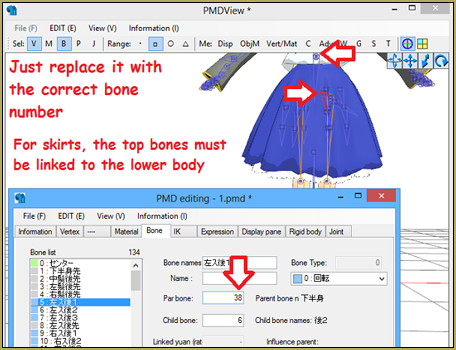 To fix this, first check if the model already has both skirt and leg physics attached. Simply click on the “P” icon on PMDView’s upper left. If they’re already attached, then check the “non-collision group” (6). This dictates what kind of physics will NOT be stopped by the current “wall” (they’re all color-coded, in case you haven’t noticed). So in case of leg physics, you’ll definitely want them to “stop” skirt physics from passing through. There are 16 groups of physics in total, although a standard model won’t use more than 4-6 types of rigid body. 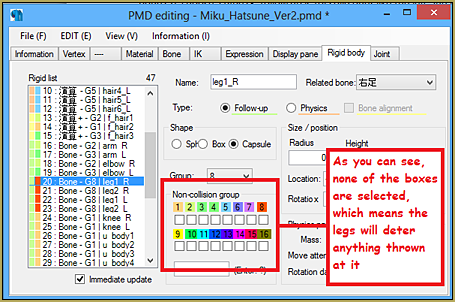 You’ll want to make sure that skirt physic’s color (in this case, purple) isn’t checked on the leg physic’s non-collision field. That should prevent the skirt from ever going through your model’s legs again! This should work unless you’re doing some extreme movements and break the defensive wall of physics, resulting in an unruly model state, but that’s okay, since that too, can be fixed! 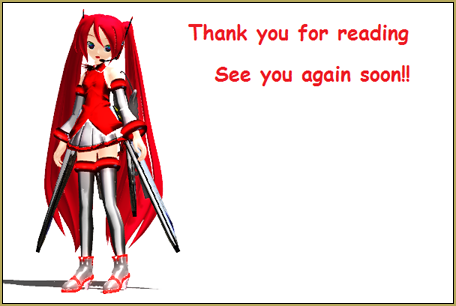 Well, that’s all for today’s Q&A session. Hopefully we’ll be able to do more in the future! If you guys have any other question, be it regarding animating, PMDE, or anything as long as it’s MMD related, then feel free to post them in the comment section or e-mail them to Mr. Reggie. We do read them, and we do give answers! This is Hiiro, signing-off for Silent Headset!! I’ve been having a bit of trouble with clothes lately. When I use high-heeled boots on my model, the feet don’t rotate with the legs when I try to move it. The other problem I’ve had was with the skirt part of this one dress on the same model. The skirt halfway-ish sticks up and I haven’t found out anyway to fix that. Are you able to help?